The oak processionary moth (Thaumetopoea processionea L.) is found in oak forests in most European countries. The caterpillars bear urticating hairs (setae) as a chemical defence. These hairs break off and are small enough to become airborne and be transported by the wind. Upon contact with humans the toxin can cause an allergic reaction that ranges from a skin rash to respiratory distress. 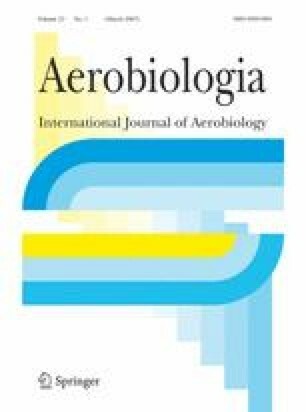 In order to measure the terminal settling velocity of this bioaerosol, we used a small elutriator and tested its functionality with particles of known aerodynamic diameter. We determined that the mean settling velocity of the setae is about 1 cm/s, corresponding to an aerodynamic diameter of 19 μm for setae with a diameter of 6 μm and a length of 190 μm. The dispersion of the hairs in the atmosphere for a typical summer day was calculated by means of an Eulerian model. The results of this calculation revealed that the maximum concentrations in the atmosphere on a typical summer day reach 20–30% of the concentration found directly at the source. Those maximum concentrations are reached at a distance from the source that varies between 174 and 562 m, depending on the atmospheric stability and the settling velocity.